There are various types of treatments for cancer and blood disorders, and the one that’s right for you depends on many factors. If you or a loved one has been diagnosed with cancer or a blood disorder, your Aspirus medical provider will work with you to develop the best individualized treatment plan for you. Together you will determine what type of treatment is right for your situation. Medical Oncologists/Hematologists - Specialists who are experts in treating people with cancer and blood disorders. Oncology relates to the study, diagnosis and treatment of cancer; and hematology relates to the study, diagnosis and treatment of diseases related to the blood. They will talk with you about the stage and extent of your illness, explain treatment options, and decide with you on a personalized plan of care. Radiation Oncologist - Expert who specializes in using radiation to treat disease. The radiation oncologist prescribes the treatment to a specific area and works with other team members to develop a treatment plan best suited for you, if you need radiation. Pharmacists - Oversee chemotherapy preparation, help you with medication instructions and fill prescriptions. Oncology Nurses - These nurses possess a wide range of skills and help implement the plan of care that you and your doctor have agreed upon. They will teach you about your chemotherapy, radiation therapy, side effects you may experience, and how to deal with those side effects. Radiation Therapists - Use specialized training to deliver radiation therapy as prescribed by the radiation oncologist. Radiation therapists position patients to receive their radiation at each treatment, monitor the patient’s progress, and refer the patient to other team members for care as needed. Medical Dosimetrists - Doing their work “behind the scenes,” medical dosimetrists develop a computerized treatment plan to give the radiation dose that the physician has prescribed for each individual patient. Medical Physicists - These specialists are responsible for installation of new equipment, establishing the planning systems utilized by the medical dosimetrists, and developing and directing quality control programs for equipment and procedures. They work closely with the radiation oncologist in treatment planning, radiation therapists in delivering treatment, and they oversee the work of the medical dosimetrist and the service engineers who work on the equipment. Registered Dietitians - Provide nutrition information and education to patients and their family members, ensuring that individuals receiving treatment understand their unique nutritional needs throughout their treatment. Laboratory Technicians - An integral part of your treatment team, they draw your blood and perform your blood tests, which often determine whether or not you can safely receive treatment. They also assist the physicians with procedures that help in diagnosing and evaluating your condition. Social Workers - Available to help you deal with the stress and uncertainty of your diagnosis, a social worker can offer help with coping, home care arrangements, financial concerns and advance directives. Ask your doctor or nurse if you would like to speak with a social worker at your appointment. Aspirus offers a wide array of treatments. The availability of treatments below may vary per location. A patient's diseased bone marrow is replaced or destroyed by anticancer drugs or treatment. 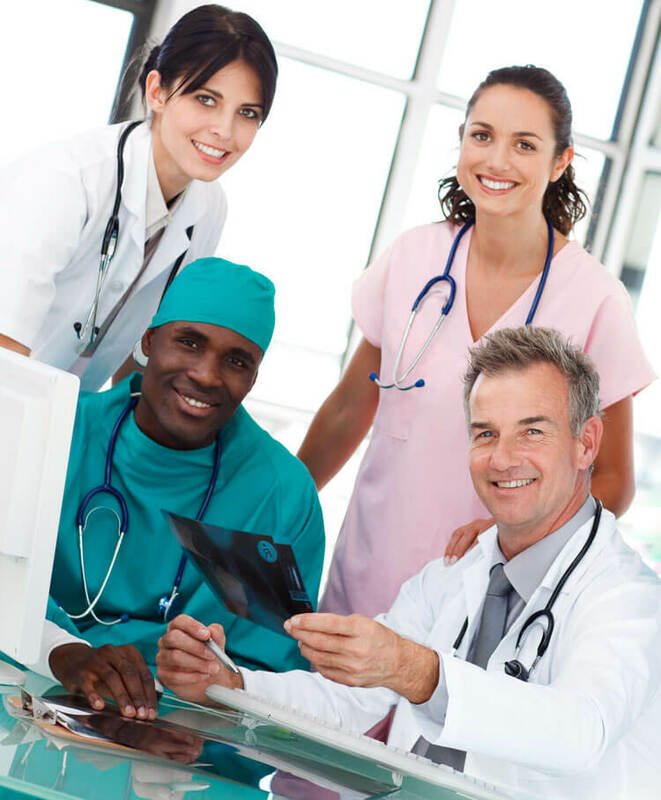 Aspirus staff will coordinate care with your selected transplant program. Chemotherapy is a common treatment that uses medicines to treat various forms of cancer. It may be used in conjunction with other types of treatment. When cancer occurs, normal cells in the body divide without any control. Chemotherapy fights cancer by stopping these cells from growing and dividing. Depending on which drugs are used to fight your cancer, you may need daily, weekly, or monthly treatments. Chemotherapy usually is given at regular intervals, called cycles. Orally (by mouth) as either a pill or liquid. An injection in the muscle or in the skin. Rarely, drugs are used topically – a cream or lotion is applied directly to an area of skin. If you or a loved one has been diagnosed with cancer, your Aspirus cancer specialist, or oncologist, will work with you to develop the best treatment plan for you. Together, you will determine if chemotherapy or another form of treatment is right for your situation. Hormone therapy uses hormones, medications, or surgery to suppress (block) or mimic hormones and alter the growth of hormone-sensitive cancer. A treatment that uses the body’s own immune system to fight cancer. Radiation therapy uses high-energy rays to kill or shrink cancer cells and decrease their ability to divide. If the disease is advanced, radiation may be used to reduce the size of the tumor and to provide relief from symptoms. Radiation therapy technology continues to advance, allowing doctors to target cancer with greater precision and safety. If you or a loved one has been diagnosed with cancer, your Aspirus cancer specialist, or oncologist, will work with you to develop the best treatment plan for you. Together, you will determine if radiation therapy or another form of treatment is right for your situation. Surgical options for treating cancer vary, depending on the type of cancer. In most cases, surgeries are performed to either partially, or completely remove a tumor or tumors. Some surgeries are performed using traditional methods, where an incision is made for the surgeon to access the tumor. Thanks to advancements in medicine, minimally-invasive surgery is now an option for some types of cancer. At Aspirus, surgeons may perform minimally-invasive surgery for prostate cancer using the da Vinci robot. Targeted cancer therapies are drugs or other substances that block the growth and spread of cancer by interfering with specific molecules (“molecular targets”) that are involved in the growth, progression and spread of cancer. Targeted therapies are currently the focus of much anticancer drug development. 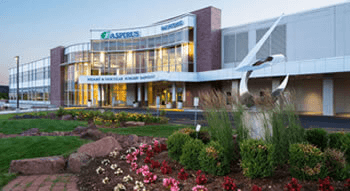 Aspirus uses the latest technology, including TomoTherapy and robotic surgery, to treat cancer. The availability of technology and services below may vary per location. 3-D Conformal Computer Planning is used to accurately determine the position of tumors in relation to healthy tissues and organs. Three-dimensional information about the patient’s anatomy in treatment planning improves both the precision and accuracy in targeting radiation to the cancer. These images show the 3-D position of a brain tumor. Referred to by many as robotic surgery for prostate cancer, or robotic prostatectomy, da Vinci Prostatectomy is more accurately a robot-assisted, minimally invasive surgery that is quickly becoming the preferred treatment for removal of the prostate following early diagnosis of prostate cancer. In fact, studies suggest that da Vinci Prostatectomy might be the most effective, least invasive prostate surgery performed today. The surgery is performed with the assistance of the latest evolution in robotics technology, enabling the surgeon to operate with unmatched precision and control using only a few small incisions. Endobronchial implants can be used to treat most lung tumors seen in the airways using bronchoscopy. A thin plastic tube is placed down the nose into the diseased airway passage of the lung. The bronchoscope is removed, but the thin tube stays in place for about two days, while radiation treatment is given through the tube. Since the tube is lying against the cancer, this in effect treats the cancer from the inside-out. High Dose Rate (HDR) Brachytherapy is a very precise form of radiation therapy in which the radiation source that delivers radiation is placed in or close to the tumor itself. This allows physicians to concentrate a high dose of radiation in a small volume, minimizing damage to nearby healthy body tissue and organs. This treatment method offers short treatment and recovery times. HDR brachytherapy can be used as a stand-alone treatment or in conjunction with other options and may be used for various types of cancer. However, it is always important to remember that each person is very different and a technology or treatment that may be effective for one person may not be appropriate for others. Intensity Modulated Radiotherapy Treatment (IMRT) system analyzes three-dimensional images of a tumor and chooses from millions of possible radiation beam arrangements to design the best possible treatment plan. This approach allows doctors to attack a tumor with multiple small radiation beams that deliver the greatest treatment dose to cancer cells, while decreasing damage to surrounding normal tissues. Intracavity gynecologic radiation treatment using GYN implants is often done to prevent local recurrence of endometrial cancer after the uterus has been surgically removed. An applicator is surgically placed in the patient and small tubes containing radiation are placed in the applicator. Once the prescribed radiation dose has been achieved, usually two to four days, the applicator and tubes are removed. Multi-modality image fusion is the ability to digitally combine images such as MRI, MRA, CT, PET, and SPECT. The combined images provide the physician with a clearer picture of the position and extent of the tumor or target area as a patient’s radiation treatment is planned. Respiratory Gating is a technique for making cancer treatments more accurate and effective by adjusting for tumor movements caused by breathing. This allows the radiation beam to turn on only when the tumor falls within the planned treatment field. This image shows the computer tracking breathing motion. The rectangles note when the treatment beam is on and the wave is the patient’s breathing cycle. Stereotactic radiosurgery is a new treatment that has the potential to prolong, or save the lives of many patients with brain lesions, or tumors. The procedure combines the technologies of the Varian TrueBeam System®. The equipment immobilizes a patient, allowing doctors to deliver radiation that conforms to the tumor(s) unlike any other form of radiation therapy. The TrueBeam™ system is an advanced radiotherapy system that opens up treatment options for some of the most complex cancers in areas such as the head and neck, lung, breast, abdomen and liver. The TrueBeam system’s advanced imaging and powerful treatment modes allow doctors to develop treatments that are best suited for patients’ individual circumstances. TrueBeam rotates around the patient to deliver a prescribed radiation dose from nearly any angle. Treatments with Varian’s TrueBeam are fast – within just minutes a day. This allows for reduced chances of tumor motion during treatment, which helps protect nearby healthy tissue and critical organs. The system includes a new “gated” option for synchronizing beam delivery with respiration. This helps maintain accuracy as the system changes its targeting whenever tumor motion is an issue, for example during lung cancer treatments. TrueBeam can be used for many forms of advanced treatment techniques including image-guided radiotherapy (IGRT), intensity-modulated radiotherapy (IMRT) and RapidArc® radiotherapy technology. TrueBeam radiotherapy is not appropriate for all cancers. TomoTherapy literally means, 'slice therapy,' and gets its name from tomography, or cross-sectional imaging. The TomoTherapy Hi•Art System® delivers a very sophisticated form of intensity-modulated radiotherapy (IMRT), and combines treatment planning, CT image-guided patient positioning, and treatment delivery into one integrated system. Its TomoImage® capabilities allow physicians to verify the position of the tumor before each treatment session, so adjustments can be made on the spot to make sure that radiation is delivered exactly where it should be. This results in radiation treatments that conform to tumors like never before which, in turn, minimizes radiation dose to surrounding normal, healthy tissues.